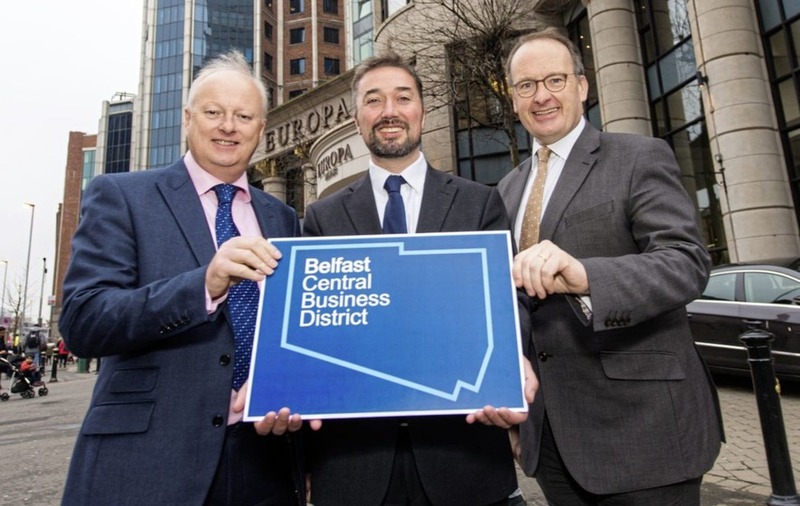 Pictured at the launch of Belfast’s Central Business District is Paul Johnson Chair of CBD, Chris McCracken, managing director of CBD and Dr Howard Hastings , managing director of Hastings Hotels and chair of Visit Belfast. The new Belfast BID (Business Improvement District) for the Linen Quarter – ‘Central Business District’ has appointed Chartered Marketer and WorldHost Trainer Christine Watson, founder of Watson & Co. Chartered Marketing to deliver a bespoke Destination Marketing and WorldHost Customer Service and Ambassador training and skills development programme. The training programme will be delivered to the brand new Belfast CBD team of six street Ambassadors, employed to deliver customer service and advice across the Linen Quarter destination throughout the Summer period and one individual appointed to an exciting one year Development post to assist the Manager of Belfast BID deliver the ambitious Belfast CBD business plan. Recruitment for all seven vacancies is currently open. Closing Date for receipt of CV and Cover Letter is Monday 18 June 2018. Read more about the exciting new posts below. To apply for one of the vacancies contact Belfast CBD Managing Director Chris McCracken on Telephone: 028 90242111 or online via recruitment platform Indeed. HALF a billion pounds of investment has been earmarked for the historic Linen Quarter of Belfast as part of a new collaborative tourism initiative. Belfast’s Central Business District (CBD) launched this week and has been created to encourage regeneration and investment into the key commercial area. The CBD opened with a business breakfast in the Grand Opera House – announcing seven priority projects over the coming months with the aim of making a tangible difference for everyone who works, lives in or visits the district. Managing director of CBD, Chris McCracken said he is excited to see the initiative finally come to fruition. “In terms of quick wins, we plan to deliver seven priority projects for the area in the next six months, including additional policing and a bespoke clean team. We will also create new events for everyone to enjoy, including street animation and promotions for food, hospitality and music,” he added. In addition to hotel investment and the Transport Hub, several other important projects have been announced for the CBD area. This includes significant new office developments at Ewarts Warehouse and One Bankmore Square; while the BBC has announced the redevelopment of the Ormeau Avenue Headquarters and Blackstaff Studios at a cost of £77m. Dr Howard Hastings, managing director of Hastings Hotels, was the guest speaker at the CBD launch and focused on the incredible growth of tourism in the CBD area, with approximately £128m invested in new and refurbished hotels, including the Grand Central Hotel, due to open in June.With 15 hotels the Linen Quarter has by far the greatest concentration of hotels in Belfast and the north. The Central Business District represents 440 business in the area South of Belfast City Hall. These cover businesses from all walks of life, but with particular strength in the hotels and hospitality industry. With the completion of 5 new hotels there will be a total of 15 hotels in the vicinity, and over half the tourists visiting Belfast will be accommodated in the Central Business District. The area also benefits from wider assets such as the Grand Opera House, Ulster Hall, and a growing number of restaurants and cafes. To support our hotel and hospitality members , and the wider growth of Belfast tourism, CBD want to recruit 7 Summer Street Ambassadors. These will be similar in concept to the London Ambassadors that made the 2012 Olympics such a success, although unlike London all our staff are fully paid. Provide a visible street presence in the area from City Hall to Ormeau Avenue / Dublin Road, with a particular focus on the 15 hotels and other hospitality business. Actively engage with tourists and visitors, providing a warm welcome to the City and signposting them to attractions, events, and local hospitality. Visit hotels in the area to provide drop in advice for guests at pre-arranged times. Participate in and support events in the area, including keynote activities such as restaurant week in August and “Better Bedford Street” from 15-23 September. Engage with the 440 business organisations within the area, acting as the public and personal face of the CBD. The Ambassador role will take place over a 13 week period from Monday 25 June to Sunday 23 September. Over the period of employment staff are entitled to 10 days fully paid annual leave. They are also entitled to apply to up to 10 days unpaid leave, although all candidates should be available for training between 25-29 June. Staff will work a 36 hour week covering 5 days out of 7. The role will primarily be during the day, but some evening work is required. Positive personal attributes such as energy, enthusiasm, resilience, and leadership. Candidates must enjoy interacting with people and the ability to effectively communicate and engage with tourists and visitors from every background and nationality is essential. Previous experience of customer service, business, marketing, tourism, and hospitality. However full training in all these areas will be given. Additional language skills are also desirable, in particular Chinese as this is a rapidly growing segment of the market. To apply for these posts applicants should send their CV and a covering letter highlighting why they want the job and how their skills and experiences meet the criteria above. This should be sent directly to Chris at Belfast CBD or submitted by recruitment platform Indeed by Monday 18 June at 5pm. The Central Business District (CBD) is an independent, not-for-profit, business organisation that focuses on delivering specific improvements to the area directly behind City Hall. The district is home to a wide range of business sectors, including law, accountancy, technology, PR, property & creative design. Many government Departments are based in the CBD, and the majority of tourists are accommodated in the area, with 15 hotels in the vicinity. CBD was democratically elected in 2017 by 440 business members, who provide £500,000 of annual funding for a five year term. The organisation also has a key role landing over £0.5 billion of regeneration earmarked for the area, and attracting future investment. Regular liaison with 440 business members from a diverse range of sectors, specifically to generate support for initiatives and events, to field queries, and resolve problems. Scoping options for grant funding, and leading applications to funding bodies. This could include heritage funding for physical regeneration projects, or European or Council funding for social regeneration projects. Helping to manage and monitor key CBD contracts, ranging from street cleaning to corporate social responsibility & social policy. Supporting the MD in the management and briefing of 6 on-street summer Street Ambassadors. Organising and supporting business networking events. Collating offers for “Alive after 5” “Sunday in the City” “Restaurant Week” and other hospitality campaigns. Organising “Big Clean Up” events, that involve local business and other volunteers. Helping develop special initiatives, such as walking tours to tell the history of Linen, opening up buildings as part of the Open House initiative, or animating the area around culture night and Christmas. Effective communication and interpersonal skills, including building rapport with business members, liaising with delivery partners, and producing reports. Analytical and problem solving skills, accurately assessing a range of information and identifying the most viable solutions. Project management skills, including producing and implementing delivery plans, understanding and managing risks, and understanding and managing budgets. Marketing and event management experience, including production of marketing collateral and use of social media and other communication channels. People management experience is desirable, but the ability to listen, communicate and motivate is sufficient, as additional management training will be provided. This should be sent directly to Chris at Belfast CBD or submitted by online recruitment platform Indeed by Monday 18 June at 5pm.